In a large dutch oven or stockpot brown meat on all sides. Add onions and saute until translucent. Add tomato if using. Turn down heat to simmer,cover, and allow meat to braise for about 20-30 minutes. Check to be sure none is sticking to the bottom. Do NOT allow the pot to go dry. Add water to pot. Bring heat up to a fast simmer. Simmer meat until tender, about 1 1/4 hours. When meat is nearly done, add carrots. After 10 minutes add potatoes. Simmer about 15 minutes, and add peas. Season to taste with salt and pepper. In a saucepan, after adding carrots to stew, make a roux from the oil and sweet rice flour. Brown at least 5 minutes. Allow to cool. When pot has returned to a boil after adding frozen peas, stir roux into the pot and allow to thicken while boiling for a couple of minutes. Turn off heat, and leave stew uncovered about 5 minutes before serving. Can be frozen in serving size portions. This is a healthy addition to the gluten free diet. 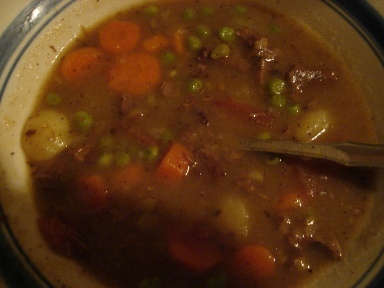 I hope you will enjoy my recipe for beef stew. Like other recipes for beef stew, this can also be made in a regular, non gluten free version by substituting regular wheat flour in the roux for the sweet rice flour in the same amount. Start to finish cooking time is about 2 1/2 hours.